Mirror, mirror on the wall, full-length mirrors beat them all! You can be the fairest of all with this contemporary oval shaped cheval mirror. You can be the fairest of all with this contemporary oval shaped cheval mirror. This solid wood satin silver finished mirror is the perfect accent piece to have in your room for when you get ready for work or a fancy evening out. Mirror, mirror on the wall, full-length mirrors beat them all! Perfectly symmetrical hexagon mirror with a mirrored frame. Add this mirror to your room to see amazing reflections of light and color. Small Bevel on each of the mirrored side adds beauty and elegance to the mirror. Use this in a hexagonal orientation; in singles or multiples, in your room. It is packaged with care and is ready to hang. This simple transitional style framed mirror will be a fabulous addition to your bedroom or dressing area. Create a peaceful space to get ready for your day, or a great place to dress for a fun night out. This piece has a rectangular frame finished in a cappuccino tone, sleek lines, and a swivel feature allowing you to move the mirror as you wish. You can easily move it around to any spot in your room for that perfect finishing touch. 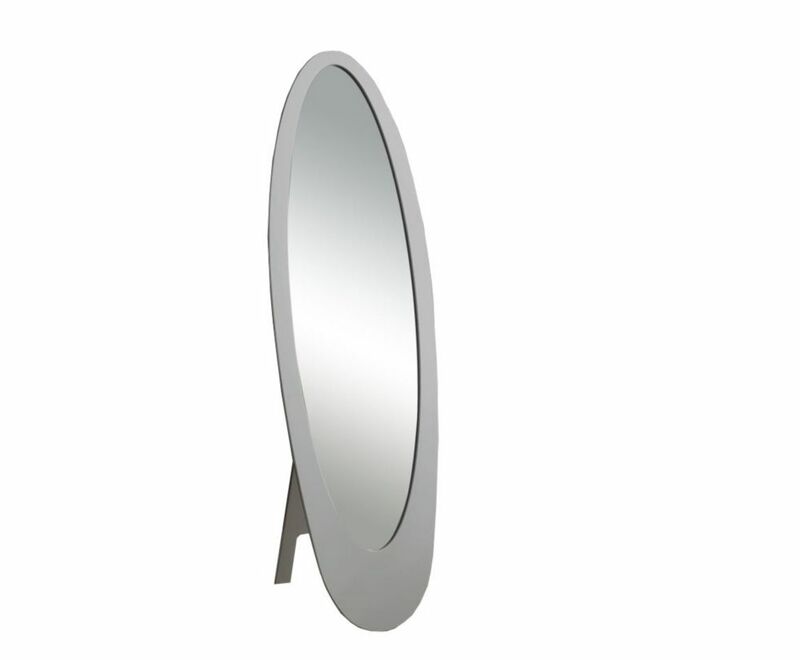 Mirror - 59"H / Grey Contemporary Oval Frame Mirror, mirror on the wall, full-length mirrors beat them all! You can be the fairest of all with this contemporary oval shaped cheval mirror.